While the birth of any child is pure joy, twins and multiples double the love. Whether you are looking for gifts for the children, the parents, the grandparents, or any loved one of a set of multiples, our collection of unique twin baby gifts are sure to delight. If you want a personalized gift for parents of twins, consider a Twin Milestones Keepsake frame, which a mother or father could fill with pictures from an ultrasound all the way to baby's first steps. Grandparents to triplets will love our white faux-suede Triplets Brag Book, or any of our other gifts for triplets. Capture your twin's and triplet's tiny hand and footprints forever with any of our handprint and footprints keepsake frames, finishing with a smiling picture of your bundles of joy. Want to share how you decorated with any of our twin gift ideas? 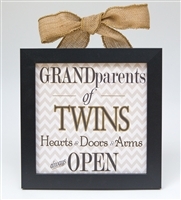 Share with us on our Grandparent Gift Co Facebook page.